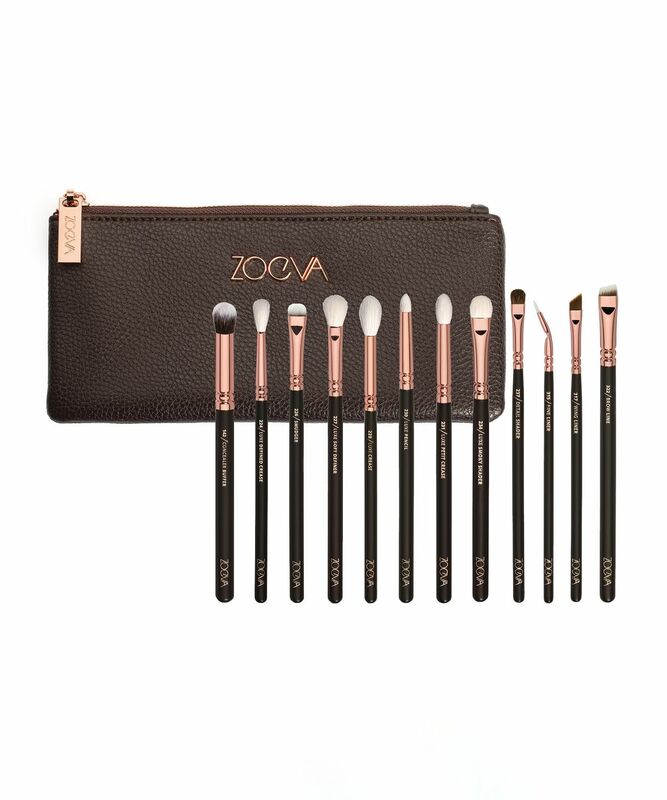 ZOEVA’s Rose Golden Complete Eye Brush Set (Volume 1) is an exquisite kit with every eye brush imaginable to conquer the smoky eye look like a pro. The design corresponds to the original Rose Golden Luxury Set Vol. 1 with black wooden handles and eye-catching rose gold ferrules, with all brushes encased in a chic chocolate brown brush case. There are 12 brushes to delicately buff in under-eye concealer, define the cut crease, smudge your eyeliner, and blend pigment into the smallest creases of the eye – as well as create a gorgeous cat’s eye flick, and take your brows to Delevingne’esque proportions. 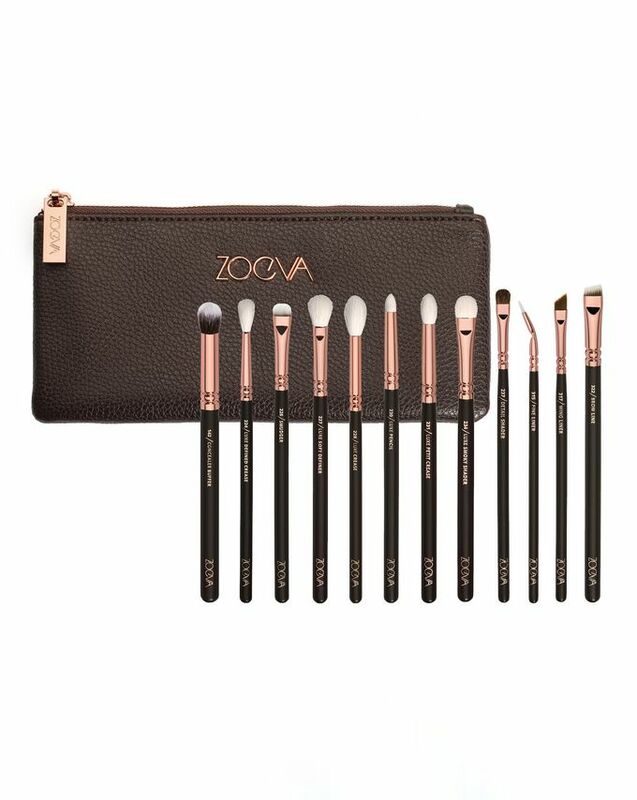 For the ultimate eye make up brush kit, ZOEVA’s Rose Golden Complete Eye Brush Set (Volume 1) is a brilliant gift for any aspiring MUA. It contains no less than 12 eye brushes with eye-catching rose gold aluminium handles – all expertly crafted so you can define and highlight your eyes and brows like a pro, as well as blend in under eye concealer. The smart brown clutch with gold ZOEVA logo is perfect for taking on your travels too. Very good beginner brushes for me is the best choice for this price. This set is a must-have! Brushes are very soft and they are a dream for blending. I also like the clutch and gorgeous design. These are the softest and best brushes I have ever used, they're worth every penny. The brushes are well made and make light work of blending & eyeshadow application. So far they have washed up nicely. For me, I feel my Sigma brushes have the edge over Zoeva for quality & performance but Zoeva wins when it comes to value for money. These are the best eye brush set I’ve ever purchased! They have everything you need when creating an eye makeup look and they perform perfectly when it comes to blending the eyeshadows. Soft, smokey, cut crease...you can create any look using these Eye Brush Set. I have a lot of nice eyeshadows but never invested in proper brushes before I got these beauties. They are a bit pricey but the overall quality and the number of brushes you get make it worth it. They are super soft and make blending eyeshadow a dream. This is literally one of the best purchase I’ve ever made. As an amateur at eye makes up I wasn't sure whether I had ordered good brushes or not. As soon as I used them I could tell what good quality they are and definitely worth the money. So much so that I have now invested in the Zoeva brush set for the face and love them just as much. It's really handy that it has written on them what they are and they're easy to clean. Never in my life have I used/purchased better brushes. These blend your concealer and shadows seamlessly and create many opportunities. They are so soft and beautiful. They are 1000% worth the £65. Ordered these brushes before Christmas, cannot rate them enough, they are really soft and apply and blend eyeshadow beautifully! I've washed them a few times now and so far there's been no shedding at all. So glad I purchased these.